Lawn seed may be sown from March to October. However, for best results, sow lawn seed in the spring from March to May, and in the early autumn from mid September through to mid October. On a dry day, dig over the soil to a depth of 20-25cm (8-10 inches). Break down any lumps and tread the soil to firm it again. Level out any bumps or hollows using a rake, aiming to create a flat, even surface. The day before sowing, water thoroughly if the soil is dry and leave to soak in overnight. TIP – The top of the soil should be dry with moist soil just below the surface on the day of sowing. Existing lawn: Remove any weeds either by hand or by using a selective weedkiller treatment. Once weeds are dead, mow the lawn closely before raking or scarifying to remove any moss and weed remains. If the ground appears hard or compacted aerate using a garden fork. Tear back the side strip to sprinkle the seed. Apply the seed at a rate of 40g/sq.m (30g/sq.m for lawn repairs). As a guide one large handful is approximately 40g. Sprinkling the seed in 2 passes at right angles to each other will help spread the seed more uniformly. Lightly rake to gently incorporate the seed into the surface. TIP – Shake the box of seed thoroughly to mix up the seeds and weigh out the amount required to cover the site. Rolling: The ground should be rolled or lightly firmed by walking over it and pressing the seed into the soil. TIP – If sowing a new lawn in very hot conditions the lawn should be watered late in the day once the sun has gone down. It is better to water thoroughly once rather than several times lightly. TIP – Alternating the direction of the mowing encourages the lawn to thicken out. Feeding: After 10-12 weeks we recommend feeding your new lawn with Aftercut 3 Day Green Lawn Feed. Simply apply after mowing for quicker more visible greener results in 3 days. 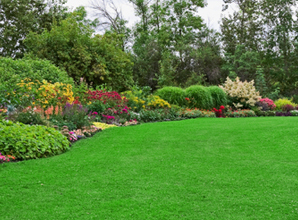 Lawn Care in spring to keep moss and weeds under control and have a great looking lawn.